Megan Heyward is a digital media artist who works at the intersection of narrative and new technologies. Her electronic literature projects -- I Am A Singer, of day, of night -- have been widely exhibited in Australia and internationally, including the Sydney Opera House; the Adelaide Festival; the Centre Pompidou; ISEA02; (Japan) Festival of Cinema and New Media; (Canada) Electrofringe; (Australia) Contact Zones; (USA) Videobrasil; Viper; (Switzerland), Stuttgarter Filmwinter; and ELO2012. Of day, of night was published by Eastgate Systems in 2005. More recently, Megan Heyward has worked with narrative and locative technologies. Her locative narrative, Notes for Walking (the space in between time) was staged at Middle Head National Park in December 2012/January 2013 in collaboration with Mosman Art Gallery and the Sydney Festival. 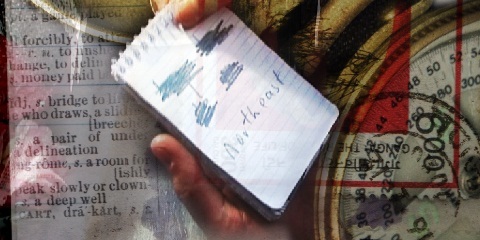 Notes for Walking is a narrative written on landscape, a locative artwork for iPhone and Android smartphones. "The work sought to be an enveloping, responsive, multimodal narrative -- one which responded to touch, made sounds, one where text would shimmer and undulate; as well as a work that made space, from a narrative perspective, for ideas of uncertainty, indecision, wandering and chance." A Senior Lecturer in Media Arts and Production at the University of Technology, Sydney, Megan Heyward is also in early stage development of a new electronic literature project for tablet devices. of day, of night (2002) was developed between 2000 and 2002 after being funded by the Australian Film Commission (now Screen Australia) in its Interactive Media Production Fund in late 1999. It is an experimental new media work that is part narrative, part game, part memory and dream. of day, of night explores the intersections of narrative, interactivity and the unexpected collisions of everyday life into dream experience. It has been recognised for its rich visual and aural landscapes, strong sense of narrative, and innovative fusion of filmic, textual, graphic, and audio elements. In of day, of night, a woman has lost the ability to dream. She sets a series of creative tasks in order to start dreaming again; such as finding and collecting objects from a series of locations in the day, imagining their fictional traces and histories, and rearranging the objects. As the user traverses the work, objects, memories and histories collide and create new meanings, as dreams arise from the fused threads of image and narrative in the dream environment of night. Conceived as an experimental digital narrative, of day, of night interweaves video, text, graphic and audio elements in a hybrid storytelling environment that moves between literary, cinematic and game-like approaches. Issues of working with the tensions between narrative and interaction were central, as well as exploring the aesthetics of digital form. My aim was to explore the creation of an immersive storytelling environment that, although desktop screen based, integrated visual, audio and participatory elements in a relatively seamless space and experience. Discussing of day, of night casually, I would sometimes describe it as "a story to climb inside", with "a fluid relationship between interactive and narrative components", since this was the kind of project that I was seeking to experience, myself. The work sought to be an enveloping, responsive, multimodal narrative -- one which responded to touch, made sounds; one where text would shimmer and undulate; as well as a work that made space, from a narrative perspective, for ideas of uncertainty, indecision, wandering and chance. of day, of night was developed for CD-ROM using Macromedia Director as the interactive authoring program, due to the extensive use of video in the work and the lower bandwidth capacity at the time. Photoshop was used for image production, After Effects for editing and compositing. I undertook the majority of the production work, including writing, producing, directing, graphic design, video editing and compositing, and the majority of the Director authoring. Sound design is by Sophea Lerner, music by David Claringbold, additional video compositing by Chris Caines, and advanced Lingo programming by Sohail Dahdal. I estimate that of day, of night took over a thousand hours to produce; it was a very large project. The final work comprises 63 Director files; 31 video files, and 132 sound files. The time and the attention to complexities needed to create this work and other works of a similar scope are a continual challenge for artists and writers who create in the field of new media. However, I am delighted that of day, of night continues to find new audiences in the field of electronic literature.